A Garuda Boeing 737-400 landed on a taxiway at Palembang in October 2008. NTSC investigators from Indonesia concluded that the captain under training and instructor captain were focussed on instrument scanning when they were following the misaligned track, leading them to the parallel taxiway. On 2 October 2008, a Boeing 737-4K5 aircraft, registered PK-GWT was being operated on an Instrument Flight Rules (IFR) scheduled passenger service from Jakarta Soekarno-Hatta Airport to Sultan Mahmud Badarudin II Airport, Palembang. There were two pilots, 4 flight attendants, and 49 passengers on board. The co-pilot who occupied the left seat was a candidate captain under training and the Pilot in Command (PIC) occupying the right seat was a training captain (instructor). The co-pilot acted as the Pilot Flying (PF) during the flight, and the PIC acted as Pilot Monitoring (PM). Prior to the departure from Jakarta, the pilots received a departure briefing consisting of weather, flight plan, and notams. 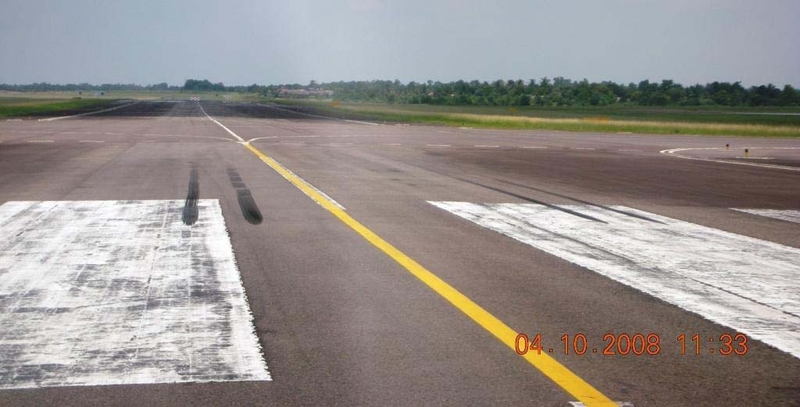 The notams contained significant information for Palembang Airport that the parallel taxiway from intersection Alpha to taxiway Bravo was closed due to work in progress. The runway 29 Instrument Landing System (ILS) was not in service due to replacement of its localizer antenna. The aircraft departed from Jakarta at 23:51 UTC. When it entered Palembang’s Controlled Airspace at 00:13, the crew was instructed by the Palembang Approach controller to track direct to the initial approaches point BANJAR and descends to 2,500 feet for the VOR/DME approach to runway 29. During the approach, the PIC reported that they were conducting the VOR/DME instrument approach procedure for runway 29. At 00:28 the PIC reported that the aircraft was on final approach for runway 29. At 00:30 the PIC reported that he had the runway insight after assuring the co-pilot that they both had seen the runway. The Aerodrome Controller gave the crew the clearance to land. The co-pilot was concentrating on instrument scanning during the approach by following the VOR radial. He wanted to improve his ability to fly manual (without auto pilot) during an instrument approach. The PIC then rechecked if there was any item missed prior to land. The ATC saw that the aircraft was not on the approach path properly and came close to the parallel taxiway. At 00:32 the aircraft landed on the parallel taxiway, touching down 500 meters from the eastern end. Both pilot then realized that they were on the taxiway and also saw the barrier on the taxiway indicated that some part of the taxiway was closed. The PIC immediately applied manual brake and the aircraft stopped at the intersection of taxiway Charlie. The landing roll distance was about 700 meters. The aircraft was then instructed to taxi via runway and taxiway Echo to the apron. No one was injured in this serious incident. The investigators concluded that the Pilot monitoring was not sufficiently looking outside to cross-check the flight path to the runway. Also, there was a misalignment of the VOR approach path. There had been 10 pilot reports of misalignment of the final track for the runway 29 VOR/DME approach since May 2008. The VOR/DME runway 29 approach track to the runway 29 VOR was 291 degrees while the runway direction was 293 degrees. The 2 degrees differences between VOR approach path and runway direction has an off track to the right of approximately 200 meters off the runway centreline at the threshold runway 29. The parallel taxiway used to be a temporary runway in 2003 when a new terminal was built. The runway markings on the parallel taxi way reappeared after some time. These markings were visible to the aircraft on final approach.